Could ‘NIFLA v. Becerra’ Change Free Speech, Abortion Law? The past week has been again filled with chaos—firings of the national security council, resignation and appointments of the legal team for Dictator Donald Trump (DDT), continued lawsuits against the federal government, additional information about DDT’s sexual misconduct as more women join Stormy Daniels, and concerns regarding the retention of special investigator Robert Mueller. No wonder that a case before the Supreme Court last Tuesday got little attention from the media. In normal times that case would have been front and center on television because it’s one of seven cases thus far this judicial year that addresses free speech—two of them major lawsuits. Last December the religious legal group Alliance Defending Freedom (ADF) and the federal government argued before SCOTUS that a cake in Colorado is free speech because the baker is an “artist.” A ruling in his favor and opposing service for a gay couple would permit rampant discrimination across the United States, not only against LGBTQ people but also anyone else who offended the religious and moral sensibilities of everyone in all businesses—retail, health care, food services—everyone. Many of California residents are unaware of expanded funding for prenatal and family planning services from the Affordable Care Act, and many clinics, especially the anti-abortion crisis pregnancy clinics (CPCs) pressure women to not have an abortion. Many CPCs hide religious affiliations and claim that they provide more services than available in the clinics. Owners and employees of the CPCs use “free speech” to object to the law by arguing that it makes them “complicit in facilitating an act they believe hurts women and destroys innocent lives.” They maintain that the FACT Act is “gerrymandered” to “commandeer” their expression, “manipulat[ing] the marketplace of ideas” to favor abortion in violation of the First Amendment. The argument from Michael Farris, a member of ADF, is that not all doctors are required to post the information, only community clinics with pregnancy-related services. He wants to move the law to heightened judicial scrutiny, which raises the legal bar for California to keep the law. Justice Samuel Alito bought the argument that the “crazy exemptions” of the law creates “a very strange pattern.” California Solicitor General Joshua Klein explained that the law targets community clinics where millions of low-income Californians get health care and exempts private physicians because they usually don’t have poorer women patients. Jeffrey Wall, the deputy U.S. solicitor general who joined Farris on behalf of the federal government, tried to persuade the justices that informing pregnant women about alternatives to abortion are necessary only when medical procedures are provided and that unlicensed clinics don’t provide medical procedures. Justice Sonia Sotomayor pointed out that CPCs sometimes provide medical procedures such as ultrasounds and pregnancy tests and give pregnancy counseling, much like doctors’ medical advice in discussing abortion procedures. Sotomayor compared NIFLA to Planned Parenthood v. Casey that allows states to pass “informed consent” laws forcing abortion providers to deliver a state-approved anti-abortion canned statement before the procedure even if the information is false. Both situations mandate information for women, one on alternatives to the clinics and the other about termination of pregnancies. Justice Stephen Breyer dubbed this issue “what is sauce for the goose is sauce for the gander.” Denying California the right to require postings at all community clinics regarding availability of free and/or inexpensive family planning services could give free speech to only one side of the abortion argument. The case was appealed to the Supreme Court after a federal district court and the 9th U.S. Circuit Court denied an injunction in favor of CPCs. Both lower courts maintained that California’s law was constitutional in the same way that Pennsylvania could require doctors to tell abortion patients about the “nature” of the procedure and the “probable gestation age” of the fetus. Observers watching the negative comments from some justices believe that at least part of the FACT Act will be struck down; the question is how much and on what grounds. Mandatory disclaimers in multiple languages on advertising for unlicensed CPCs may be unconstitutional. Requiring clinics to tell patient about a lack of license seems legal. The middle ground is the crux: whether states can force CPCs to tell patients about services elsewhere. A serious problem in this case comes from dangers in CPCs that promise medical assistance but have the sole purpose of forcing a woman to carry a fetus to full term. Over 2,700 CPCs throughout the nation lure pregnant women into their facilities and then terrify them with lies about their future if they have abortions. States like Texas are using public funds from bona fide community clinics to unlicensed CPCs exempt from regulations or credentialing because they provide only non-medical services such as self-administered pregnancy tests or parenting classes. One-fourth of Texas’ 200 CPCs are funded by federal taxpayer money through the $38 million operating budget of “Alternatives to Abortion” for low-income women. With no government oversight, the “Texas Pregnancy Care Network” subcontracts with 51 CPCs with most money going to “counseling,” a term with no definition. Another $739,000 went to advertising. When asked if the CPCs were medically licensed, a state spokesperson said that they are not medical clinics. People who go to CPCs don’t know they won’t get any medical care. Austin (TX) tried to pass an ordinance requiring that clinics state whether they have doctors. A federal judge struck down the ordinance with the argument that it violated CPCs’ due process. Texas law does require doctors to lie to women about medical risks of abortions, a procedure with less risks than pulling wisdom teeth or taking out tonsils. 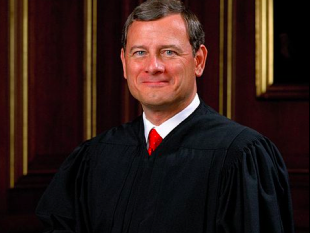 In his 12 years as Chief Justice, John Roberts has greatly expanded the definition of free speech for corporations. To him and a majority of the justices in Citizens United, all money is free speech meaning unlimited anonymous corporate donations to political candidates, a ruling later expanded in McCutcheon v. FEC. These cases, and others such as Hobby Lobby allowing corporations to deny birth control to employees using faulty scientific information, shows that Roberts’ defense of the First Amendment protects only corporations. He uses the same argument to give corporations benefits in cases involving drug advertising and trademark regulations as well as removal of unions’ rights. A recent case argued whether state laws can permit mandatory fees for workers to pay for the support services that unions are legally to provide all employees. Although the Hobby Lobby decision could be much more far-reaching than Citizens United, Windsor, and overturning the voting act, the case of McCutcheon v. FEC matches Hobby Lobby in impact. 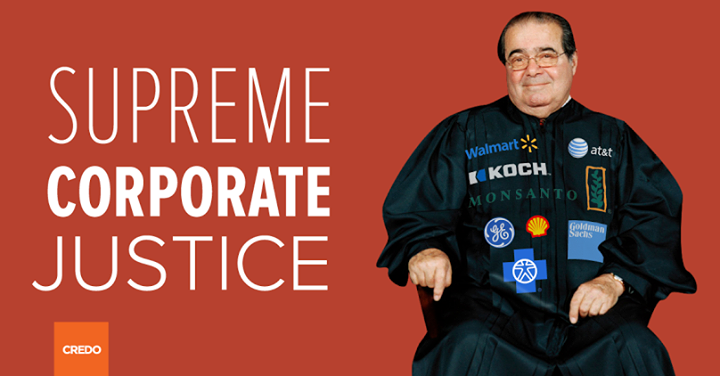 Through declaiming “free speech, the U.S. Supreme Court again put democracy up for sale. Its decision struck down the $123,000 two-year limit to campaign contribution limits, $48,600 to all federal candidates and $74,600 to all political committees. The aggregate limits that stopped money laundering schemes in which donors and political parties could evade the cap on donations to individual candidates has been erased. Now people can donate the maximum per-candidate and per-party to as many sources as they want. One person can now donate $3.6 million directly to candidates and parties in a single election cycle and much more to “independent” groups like Super PACs because of Citizens United. Donated money can legally be redistributed to the races where it is likely to have the most impact. The 32 top Super PAC donors who gave $9.9 million each matched the $313 million raised from small donors for both Barack Obama and Mitt Romney of under $200 from 3.7 million people. Almost 60 percent of Super PAC funding came from 159 donors, and more than 93 percent of the Super PAC money came in contributions of at least $10,000 from only 3,318 people—0.0011 percent of people in the United States. Shel Adelson’s $91.8 million donation is equivalent to the entire net worth of 322,000 average-earning U.S. families. Reince Priebus, RNC chair, is cheering. House Speaker John Boehner (R-OH) praised the Supreme Court. Justice Clarence Thomas wrote that he wanted to erase all contribution limits. With more and more evidence against Singer’s position, McCutcheon needs to bribe more people to legislate in his favor, and SCOTUS just gave that ability to him. Each oil, coal, and gas industry executive can spend $312,455,200 in this election to buy lawmakers. That’s a 2,600 percent increase in their legal donations. And it’s a pittance to them. The $150 million that Shel Adelson and his wife donated to GOP PACs last year is the equivalent of $280 to a person worth $50,000. Adelson makes $32 million, more than twice the $150 million, each day for the entire year. In 1976, the Supreme Court ruled that the legal basis for upholding campaign finance regulations is to prevent corruption. The Roberts Court takes the position that there are no strings attached to the huge sums of money that wealthy people pay for lawmakers. The majority’s definition of the corrupting “quid pro quo” exists only if a specific result is purchased from a specific legislator—according to five members of the Supreme Court. As in Citizens United, the majority of the court fails to consider “the possibility that an individual who spends large sums may garner ‘influence over or access to’ elected officials or political parties. Once again, Roberts tells Congress that if they want good laws, then they should pass them—knowing full well that the GOP will never try to pass any controls on campaign contributions until it works against them. “In the past four years, under the leadership of Chief Justice John Roberts, the Supreme Court has made it far easier to buy an election and far harder to vote in one. “The Court’s conservative majority believes that the First Amendment gives wealthy donors and powerful corporations the carte blanche right to buy an election but that the Fifteenth Amendment does not give Americans the right to vote free of racial discrimination. Media contributes to the dumbing down of people in the United States. Today’s Huffington Post shows how far downhill it has gone since it was sold. The “business” section starts with Starbucks resuming its selling sweetened bread by the slice. This announcement was before GM’s CEO, Mary Barra calling the failure of her company to recall defective cars that killed 303 people in the last 12 years as “very disturbing.” Following that was the vital information from WSJ that Southwest Airlines is beginning to look just like all the others. An article on two men saving puppies from a flood is followed by gratuitous celebrity reporting, including “Britney Spears news.” Under “Twitterati” is Justin Bieber’s sage comment, “Why does everyone look like my mom on twitter. lol.” Finish with “how long would you survive the zombie apocalypse,” and you have a diet of reports that can well compete for the most inane Internet entries for the day. This is the kind of money that bought five justices on the U.S. Supreme Court. Today is National Walking Day, the day that the U.S. Supreme Court walked away from the U.S. Constitution—again. “It is reasonable to construe what Congress has done as increasing taxes on those who have a certain amount of income, but choose to go without insurance. Such legislation is within Congress’ power to tax.” Chief Justice John Roberts included this statement in his majority ruling that retained the Affordable Care Act with the exception of the Medicaid piece that threatened states not extending Medicaid with the government’s withdrawing all Medicaid funding. States that do not expand eligibility will lose only the funding for the expansion. Roberts was joined by Justices Stephen G. Breyer, Ruth Bayer Ginsburg, Elena Kagan, and Sonia Sotomayor. People guessing when the justices would deliver their decision waited for weeks until the very last day of their session. Conservatives were confident that they would be victorious in the ACA being struck down, and Democrats worried about the same result. Out of 21 constitutional law experts in the country, 19 thought the ACA is constitutional, but only eight of them predicted that the court would uphold it because of the behavior of conservative justices during the oral argument. Maybe the most remarkable thing about the ACA is how little people understand it and how much they hate it. The biggest problem with evaluating the “hate,” however, is that there were two reasons for not liking the ACA: either people didn’t want any mandated health care, or they wanted a single-payer plan. Those with the latter opinion didn’t oppose the mandate, but the polls never differentiated between the two. Where did the hate come from? Conservatives railing against today’s decision have forgotten that the conservative public policy research institution, Heritage Foundation, proposed mandated health coverage over 20 years ago. Before President Obama, the individual mandate had Republican support. Conservatives who originally supported it during a Republican administration came out in solid opposition after President Obama was elected and pushed for this law. Democrats got nervous about being part of mandated health care after the Tea Party revolution, leaving only attacks on the law. The polls went down on health care, and the progressives said even less about it, causing the polls to sink more in a downward spiral. The media joined the conservatives in their frequent use of “government run” to describe the act despite the fact that the law require people to buy insurance from private corporations. One reason that many people thought that ACA would be struck down is that they no longer see SCOTUS as an impartial court that uses constitutionality to rule. Retired Justice John Paul Stevens wrote in his minority dissent to the Bush v. Gore decision that the ruling threatened “the nation’s confidence in the judge as an impartial guardian of the rule of the law.” The Citizens United case that was confirmed on Monday completed the threat, closing the door on democracy in this country. Seventy-one percent of people in this country believe politics would influence the Supreme Court’s ruling, compared with 20 percent who said the court will decide the case solely on legal merits. As pieces of the ACA started going into effect, more and more people appreciated it: 86 million people have received free preventative care, 105 million no longer face a lifetime cap on benefits, as many as 17 million children can no longer be denied coverage because of preexisting health conditions, and 6 million young people under the age of 26 can be included on their parents’ insurance policies. Despite the plaintiffs’ claim that ACA is not constitutional, they showed that they believed it is in their brief. All people need to buy health insurance—the “individual mandate”—because companies would go bankrupt or policy costs would be unreasonably high if people bought it only after they get sick. The Constitution authorizes Congress “[t]o make all laws which shall be necessary and proper for carrying into execution” regulations of interstate commerce. As conservative Justice Antonin Scalia explains, this means that, “where Congress has the authority to enact a regulation of interstate commerce, it possesses every power needed to make that regulation effective.” He took exactly the opposite position in his dissent today. Congress further viewed the mandate as necessary to prevent “adverse selection” to “game” the new insurance rules, which proponents warned would spark a “death spiral” in insurance. If the mandate falls, the guaranteed-issue and community-rating regulations must therefore fall with it, as the Government itself has conceded. So the plaintiffs admitted that the Scalia Rule applies in this case. Who has gained today? According to Avalere Health, the swing states benefit the most, getting insurance access to about 22.4 million people and subsidies for another 7.5 million. About 15 million people in those states will be eligible for Medicaid if those states decide to extend the program with federal funding. Women gained big time today in terms of contraception and elimination of discrimination in costs for insurance policies. At this time, women pay $1 billion more for health insurance than men. Women pay more than men in 92 percent of best-selling health plans within states that permit gender rating. In most states, non-smoking women are commonly charged more than even smoking men. Even with maternity coverage excluded, nearly a third of plans charge women ages 25 to 40 pay at least 30 percent more or even higher than men for the same coverage. Those who become very ill gained today. ACA ends lifetime limits on coverage in 2010. It phases out annual limits on coverage by 2014, important for people with high medical bills from conditions such as cancer. Taxpayers have also gained today because they no longer have to pay for uninsured people to go to emergency rooms and clinics. Because people are required to have health insurance, their health costs will be much less—and paid for by insurance. And Thomas Jefferson gained today: one measure he supported would have required people to pay into a public health insurance. Even insurance companies will gain from additional customers although it has lost $1.1 billion in rebates to the insured. ACA requires that insurance companies spend at least 80 percent of subscriber premiums on health-care claims and quality improvement initiatives. According to a recent report, 12.8 million people will receive rebates this year with an average of $151 per household. Republican lawmakers are spitting mad and intend to put the ACA up for a vote in the House on July 9. Mitt Romney has accused President Obama of spending all his time on the lost cause of “Obamacare” instead of the economy. The Republicans plan to do exactly what Romney accused the president of. Dissenting justices Samuel Alito, Anthony Kennedy, Antonin Scalia, and Clarence Thomas use the same convoluted verbiage that other conservatives do: even constitutional provisions must be ruled unconstitutional because “the Act’s other provisions would not have been enacted without” it central elements, the mandate and the Medicaid provision. They might be able to get a very high price for their crystal ball that looks into the future. The case is easy and straightforward, however, in another respect. What is absolutely clear, affirmed by the text of the 1789 Constitution, by the Tenth Amendment ratified in 1791, and by innumerable cases of ours in the 220 years since, is that there are structural limits upon federal power—upon what it can prescribe with respect to private conduct, and upon what it can impose upon the sovereign States. Whatever may be the conceptual limits upon the Commerce Clause and upon the power to tax and spend, they cannot be such as will enable the Federal Government to regulate all private conduct and to compel the States to function as administrators of federal programs. To reach this conclusion, these four had to not only reject a century of Commerce Clause jurisprudence but also ignore the Necessary and Proper clause, and Congress’ taxation power. Their belief in the “sovereign states” is ironic when considering that these same conservatives voted against states rights in one of the decisions announced on Monday, the continuation of Citizens United. Based on the flimsiest of arguments, the four dissenters want to kill progressive legislation basically because their political ideologies tell them to do so. Obamacare “puts government between you and your doctor.” All insurance is with private companies. “Having 20 million people, up to that number of people, lose the insurance they want, is simply unacceptable.” If he’s talking about people who get their insurance through employers, their insurance companies are frequently changed, and ACA requires more coverage than many people have now. If they change, they benefit. “And something that Obamacare does not do that must be done in real reform is helping lower the cost of healthcare and health insurance. It’s becoming prohibitively expensive.” The only way that progressives could lower healthcare cost is by regulation, a permanent no-no by conservatives.